Head coach Dan McFarland dismissed a suggestion that Leinster missing Jonathan Sexton for this afternoon’s European Champions Cup tie was a psychological advantage to Ulster. Sexton was the notable name missing from yesterday’s team announcements ahead of this evening’s quarter-final tie at the Aviva Stadium, Dublin (kick-off 5:45pm). 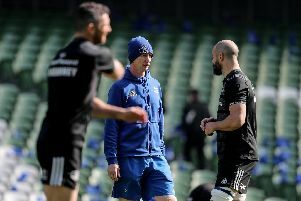 The flyhalf, voted World Player of the Year, has been troubled with a leg issue all week and the niggle continued during his Captain’s Run in the Aviva yesterday and that was enough for Leinster coach Leo Cullen to withdraw him and put Ross Byrne in as starting number 10. Ulster’s McFarland certainly did not entertain the notion the absence of Sexton boosted his side’s chances against the defending champions. Highlighting Bryne’s input to Leinster’s pool stages success, McFarland was focusing only on what his side needed to deliver as they prepare for their first last eight appearance since 2014. “We want to go out there and put our best game on, that is the bottom line,” said McFarland. “I think there would have been a lot of interest around the Leinster team selection, particularly around Johnny not playing, but from my point of view Ross Byrne played well in rounds five and six. “He steered them to comfortable victories away to Wasps and at home to Toulouse. “He’s an excellent player with some great facets to his game,” added McFarland. Ulster were boosted by the return from a knee injury of Iain Henderson, while Darren Cave and Marty Moore also got the medical all-clear to play this afternoon.